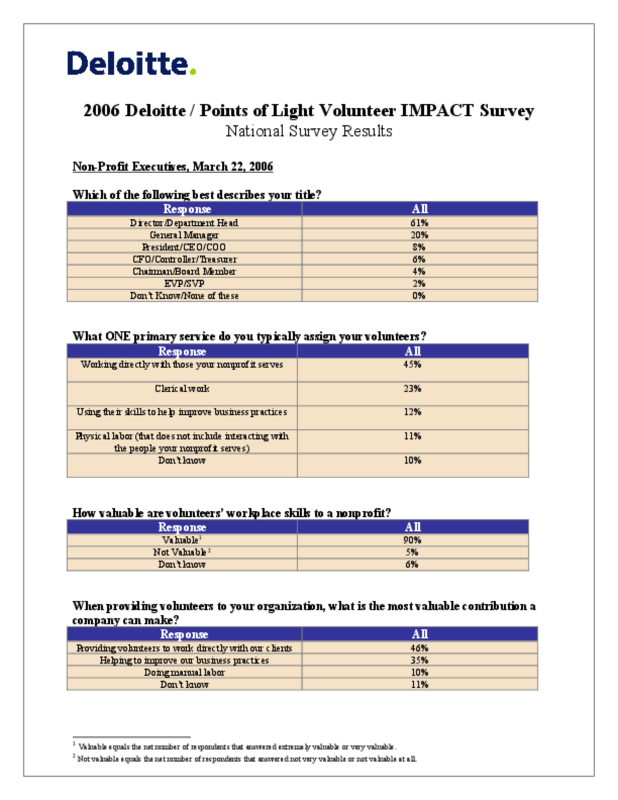 The 2006 Deloitte / Points of Light Volunteer IMPACT survey was administered by Opinion Research Corporation. A nationally representative sample of 750 white-collar workers who hold owner/manager or sales/clerical positions was asked eight aided and unaided questions in a CARAVAN(R) omnibus survey conducted March 2-6. Two subsequent, but independent, questions were asked of 755 white-collar workers March 23-27. Both surveys had margins of error of +/- 3.6 percent. A nationally representative sample of 200 nonprofit directors and managers were asked 10 different aided and unaided questions during an online survey conducted March 23-24. That survey had a margin of error of +/- 7.0 percent. Copyright 2006 Points of Light & Hands On Network. This information is reprinted with permission from the Points of Light & Hands On Network. All rights reserved.